Vaginal dryness is very common and can cause discomfort and irritation and is experienced by most women from time-to-time, particularly during or after the menopause. 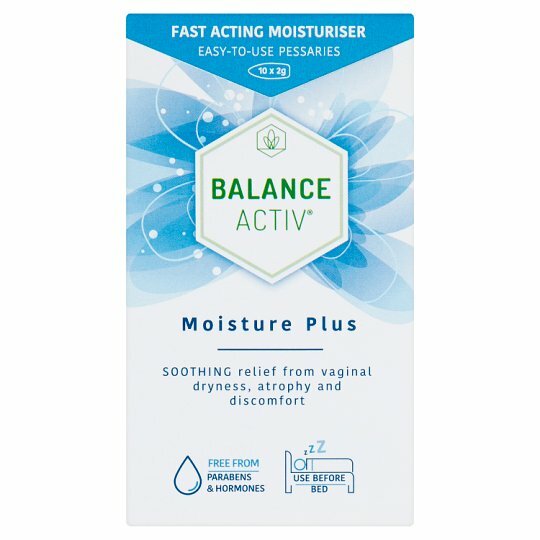 Balance Activ­™ Menopause Moisture Pessaries Plus is a hormone-free vaginal moisturiser designed to work in harmony with the body to restore moisture in cases of vaginal dryness and atrophy. It promotes healing after childbirth, in gynaecological surgery, in cases of dystrophy resulting from chemotherapy, ionising radiation and vaginal dryness also due to oestrogen deficiency. Balance Activ­™ Menopause Moisture Pessaries Plus contain Hyaluronic Acid (HA), a mucopolysaccharide which is naturally present in the body. HA functions as a structural support, giving tone, nourishment (trophism) and elasticity to tissue. Adjuvant treatment of reparative processes in atrophic and distrophic conditions of the vaginal mucosa. Store the pack away from light and heat, preferably at a temperature between 4°C and 25°C., The expiry date refers to the product in an unopened and correctly stored pack. Use one pessary daily to treat symptoms of vaginal dryness and atrophy then reduce usage to two or three times a week as required. Use before bed for mess-free treatment. Please consult your doctor or midwife before use of Balance Activ™ Menopause Moisture Pessaries Plus if you are pregnant or breast feeding. Read the package insert inside carefully. Warnings Keep the product out of the reach and sight of children. Avoid contact with eyes. Do not swallow. Do not use if the pessary is opened or damaged. Do not use the product after the expiry date.